Preliminary design plan for a large scout cruiser, prepared to support General Board discussions concerning the characteristics sought in future cruisers. 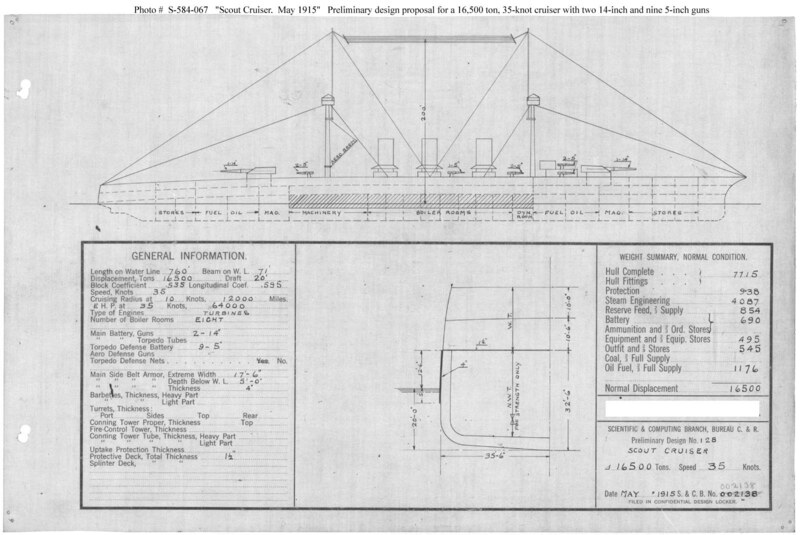 This plan provided two 14-inch guns and nine 5-inch guns and a speed of 35 knots in a ship 760 feet long on the load water line, 71 feet in beam, with a normal displacement of 16,500 tons. This design included 938 tons of armor protection, including 4-inch side armor over 296 feet by 17 feet 6 inches amidships and 1.5-inch deck protection, adding 6,000 tons displacement over design No.112. This design was second in a set of three requested as a group at the end of April 1915, apparently to further explore tradeoffs among armament, protection, and size in scout cruisers. This design series took Preliminary Design No.112 (see Photo # S-584-050) as a baseline. Ultimately, however, no ships of this type were built. Note: The original document was a blueprint (white on blue).